In the discovery of the Americas, Christopher Columbus’ flagship was the “Santa Maria.” It was the biggest of the small fleet of three. 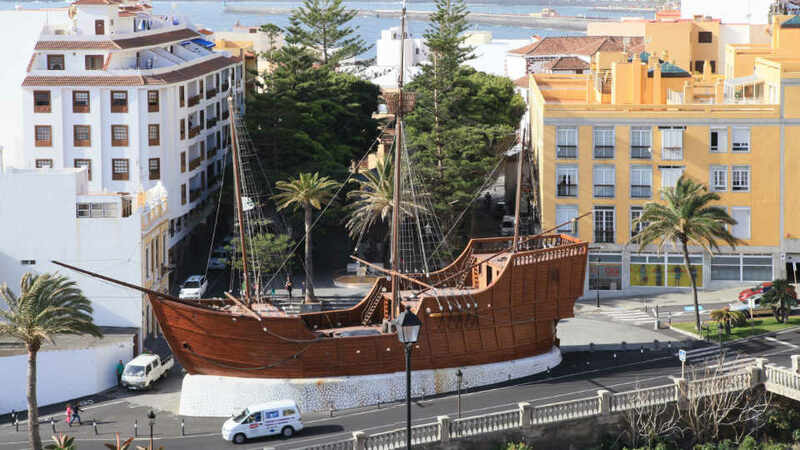 And, for a couple of decades now, it’s been docked next to Plaza de la Alameda in Santa Cruz de La Palma. Well, its replica, the Naval Museum named Barco de la Virgen, that is. It’s not every day that people see a 15th-century vessel, and most definitely never by the roadside. There are also very few ship museums around the world. Simply put, La Palma’s very own Naval Museum stands out in every way. Why Visit Barco de la Virgen? In 1940, a band of locals with a strong penchant for sailing and shipbuilding got together. And, when creative and passionate people gather, great things happen. Led by Armando Yanes, the group created a precise duplicate of Columbus’ Santa Maria. They also found the perfect home for the marvel – the ancient city of Apurón. It was the port where ships heading to the Americas stopped. Thus, it deserved to house a copy of the craft that discovered the New World, the reason that route even exists. The nautical clone was named Barco de la Virgen after La Palma’s patroness, Virgen de Las Nieves. And, of course, it is embellished, along with the whole town, for the island’s most important celebration held every five years – the Descent of Virgen de las Nieves or the day the patron came into the city. Some may ask, “Why should we get on a ship that doesn’t sail?” A running replica voyaging the Atlantic and showing tourists magnificent sights is interesting. But, Barco de la Virgen also has its undeniable charms and edge over the others. More known as the Naval Museum, it is, in essence, La Palma’s treasury of maritime history. It boasts the island’s rich seafaring past with artifacts shown in six thematic areas. All displays and interactive screens also have explanations in Spanish, English, and German. The exploration of the archaic reproduction starts with the ‘Age of Discovery’ area. It explains the island and the archipelago’s vital role in the discovery of the New World. Next is the ‘Golden Age of European Trade’ which heavily relied on sugar and wine. The profitable relationship of La Palma, Europe, and the Americas is explained here. In the ‘Route to Cuba,’ it is all about the immense migration and trade in the 19th century between the two islands. The last three sections are more about La Palma alone. One is about the island’s naval carpentry industry that thrived in the 19th century. Then, the Correíllos, courier-type ships, ruled the Canary side of the Atlantic in the 20th century. It was when inter-island communication and transportation of goods must travel by sea. Lastly, the role of the Barco de la Virgen in the Descent of Virgen de las Nieves celebration is also explained. The Naval Museum is open from 10:00 AM to 6:00 PM every weekday. On weekends, it caters to guests from 10:00 AM up to 2:00 PM. As for the entry fee, it ranges from €3 to €4.50. Also, visit the Descent of the Virgen Visitor Information Center for a discount. The combined entry fee for both museums ranges from €4 to €7. Children up to 12 years can come in for free, but they must be accompanied by an adult. The Naval Museum is near other popular tourist attractions. Visit them too and get to know La Palma more. The Museo Insular de La Palma is at the other side of Plaza de la Alameda. Castillo de la Virgen is to the north of the ship, while Castillo de Santa Catalina is on its south. They are all only a three to five-minute walk away from the museum. Santa Cruz de la Palma is home to many restaurants, bars, and cafes. A good number of which are in or near the area where the Naval Museum and other tourist spots are located. From the Barco de la Virgen, they can also go further south for more dining options. For tasty Canarian and Venezuelan specialties, march to the Bar Arepera El Encuentro. Although the place has an indoor space, many diners prefer to sit outside. And, who wouldn’t? It’s in an old city center known for its beautiful heritage houses. The island vibe that the palm trees give also add to the fun atmosphere. Their best-sellers include areperas, boccadillos, croquette, enchapa, salads, and tapas. Pair any of those with either their freshly squeezed orange juice or sangria. After their first bite, diners finally understand why even the locals love it here. The prices are reasonable, and the food is always delicious. The small but very popular Cafe Melchor is a full house all summer. During other seasons, it’s still bustling with diners most especially by sundown. Their must-trys are tortilla de papa, revuelte vegetale, plato de pulpo, paella, ham & cheese filled croissant, meatballs, and tapas. To make the dining experience memorable, don’t miss their coffee and ‘1906’ beer. What is a holiday without pasta or pizza? A lot of people can’t survive a couple of days without a bite of these Italian favorites. And, because tourists want it, Santa Cruz de la Palma has it. Piccolo Pizzeria Paladar is one of the best Italian restaurants in the whole town. Their pizzas are freshly made and fire oven-baked. And the pasta is always delicious and never dry. What’s more, diners can enjoy them with fantastic sea views. Their crusted best sellers are the Margarita, Sabrosa, and the house specialty – Piccolo with tomato, mozzarella, ham, mushroom, and egg toppings. Just a heads-up though. When you see pepperoni on the ingredients, it’s pepper, not the meat. For pasta, try their penne a carbonara and seafood risotto. The other crowd favorites are the tortellini, steak with pepper sauce, tiramisu, and pannacotta. They also have a great selection of wines, but the sangria is their most ordered drink. Every inch of this vessel is a proof of the islanders’ impressive shipbuilding skills. Within its wooden frame is a vault of this wonderful green haven’s rich nautical history. It is also a reminder of the Canaries’ crucial role in the discovery and colonization of the New World. It’s not all about showcasing the island’s times gone by though. It also helps La Palma navigate through the ocean of tourism. More than a maritime museum or reproduction, the Barco de la Virgen is the past and the future. See it. Know it. And, be a part of it.